I love romantic suspense, and I enjoyed the last Alexandra Ivy book that I reviewed. Kill Without Mercy is a fantastic romantic suspense with a chilling mystery at the heart of it. Annie's history is complicated. She's survived some incredible traumas, and is now a guarded, vulnerable young woman on the verge of more suffering. Rafe is delectable Alpha male--possessive and protective without crossing the line into entirely overbearing. Given all that Annie has to survive, I was more on board with some of the decisions Rafe made to protect her than I might have been if it didn't feel so necessary to delay some of the bad news. I did want him to engage in a bit more...wooing, I guess. Not that there's time for it (and certainly, they do take a few moments outside of their investigation), but a little less confidence from Rafe about the outcome of their relationship, combined with a bit more romantic effort might have been nice. Plot-wise, the story follow Annie as she returns to the site of her childhood trauma, determined to untangle some present-day truths. Meanwhile, Rafe is in town to empty his grandfather's house before selling it. Their paths cross, Rafe's protective instincts are tweaked, and Annie finds herself desperately needing a friend. I thought these two had strong chemistry, but it was really the mystery/suspense component that was strongest for me. I wanted to know the truth about the murders. I needed to find out the truth, and that kept me flipping pages. The entire story was quite compelling, and chilling. There is a very slight paranormal component in this story--I liked it, and I liked how it created a bond between Rafe and Annie. I'll keep an eye out for future titles in the series. The rest of the ARES Security team were involved enough in Kill Without Mercy to interest me in their future love stories. 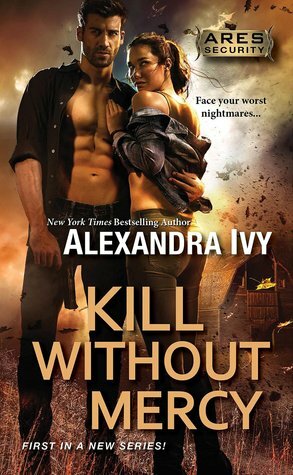 If you enjoy romantic suspense, I think you'll enjoy Kill Without Mercy. The suspense side is very strong, and the romance is pretty good.